We begin our journey with the Old Testament. The exact books that make up the Old Testament vary among Christian denominations with some including only the books found in the canonical Hebrew Bible of Judaism and others also including all or some of the deuterocanonical (second canonical) books which consist of Jewish writings that were included in the Septuagint which is the Koine Greek translation of the Hebrew Bible that was translated in stages between the 3rd and 2nd Centuries BC in Alexandria. The nature of these books was in dispute in the early Church, and they are not considered canonical in Judaism although they were read by the Jews and some passages from them are cited in the New Testament. When I first read the Bible, I read an NIV copy, which, being a modern Protestant translation, did not include the deuterocanonical books. During this study, I will include these books seeing as they are available with the WEB translation and I think it will be interesting to encounter these works regardless of their canonical status. The first five books of the Old Testament (Genesis, Exodus, Leviticus, Numbers, and Deuteronomy) are known as the Pentateuch or the Torah which is Hebrew for “law”, “teaching”, or “instruction”. According to Jewish religious tradition, the Torah was authored by the Hebrew prophet Moses. In addition, the Torah itself and later books of the Bible including the Gospels attest to the Torah as being the work of Moses. When it is said that Moses wrote the Torah, the claim is that Moses was the primary author, but that he likely drew upon existing materials when writing the portions that predate his life and that later editors added some expository material such as the recording of the death of Moses and helpful annotations that provide updated names of peoples and places so that later Jewish readers during the time of the Jewish Kingdom and the Babylonian Exile could understand archaic references. It will force me to write regularly which is a long languished goal of mine. At the end, I will have completely read the Bible for a second time. I will be able to record and focus my thoughts and understanding of the Bible. Hopefully, I can provide some commentary of interest or value to my right-wing Christian brothers and sisters and to my atheist comrades. For my translation, I’ve decided to use the World English Bible (WEB) as I like the principles that it is based upon – especially the fact that it is copyright free. You can read more about the WEB here: http://www.ebible.org/web/webfaq.htm. The Christian Bible consists of two book collections: the Old Testament (or Old Covenant) and the New Testament (or New Covenant). The Old Testament is essentially the books of the Hebrew Bible while the New Testament collects the early Christian writings that recorded the lives and teachings of Jesus and His early followers. As I begin a given section or book, I will provide some introductory comments for it. It seems appropriate for me to briefly discuss here the logical dependencies of my religious beliefs as this will provide some insight into how I approach the Bible. The starting point for my religious beliefs is theism. I’m not trying to justify my beliefs here and so will not go into how I arrived at my theist position, but it is mostly independent of my other more specialized religious beliefs other than some interplay with my second foundational religious belief: the belief in the truth of the Gospels which provide accounts of the life and teachings of Jesus of Nazareth. 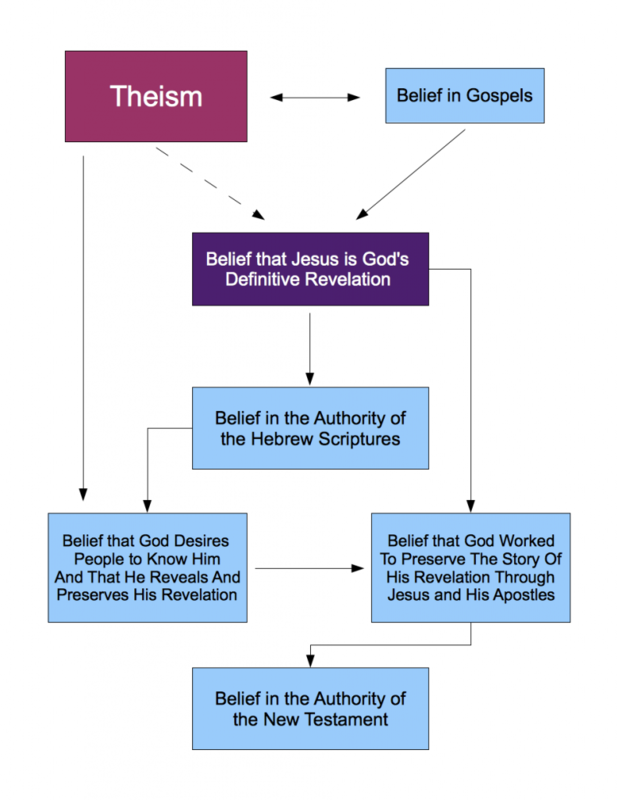 While theism is definitely the logically prior belief and the core belief that provides a foundation for the rest, my belief in the truth of the Gospels does provide supporting evidence for my theism even as it depends upon the possibility of the theistic hypothesis. From my theism and from my acceptance of the Gospels follows my belief that Jesus is God’s definitive revelation to mankind, and it is this belief that forms the backbone of my belief in the truth of Bible and also represents the key to my interpretation of the Bible. The Bible is a large collection of writings that span across centuries and cultures. There are definitely passages that taken together present ambiguities or difficulties – though by no means are they necessarily the contradictions that a naive skeptic would paint them as. In fact, with a proper understanding of the relevant cultures and historical context as well as a proper attitude towards the text (seeking a solution rather decreeing an insurmountable problem), I find no contradictions in the Bible. What better place to start than “In the Beginning…“? Many Christians in America align themselves with the Republican party. Once upon a time, I was among their number, but after a renewed commitment to my faith, I found that the more I studied and understood my faith, the more my old conservative ideology crumbled away. Today, I am convinced that the Republican party and its values are far from the values that God would have us embrace and that Republicans and many Christian leaders in America today have more in common with the Pharisees than with Jesus. 90 percent of the time, when you ask a Christian why he or she votes Republican you will find that a big factor is that he or she finds voting for a politician who supports abortion unconscionable. I’ve been there myself as a fellow pro-life Christian and know that the intentions are honorable, but the sad truth is that the issue of abortion is simply a political football in American politics. While Christian voters pat themselves on the back for pulling the Republican lever election after election, nothing has changed to stop the deaths of millions of unborn children every year and nothing will if Christians keep allowing themselves to be manipulated by politicians. Consider that it has been over 30 years since Roe v. Wade, and we are no closer to overturning that decision today. More importantly, Republicans have had control of all three branches of government for six of the last eight years. From 2000 to 2006, we had a Republican majority in Congress, a Republican President, and 7 Republican appointed judges out of the 9 justices on the Supreme Court. And yet, no legislation was ever passed to challenge Roe v. Wade. Instead of making excuses for the Republicans, we need to call a spade a spade: the abortion issue is a wonderful carrot to dangle in front of Christians to get their vote every election cycle, and the Republican party sees no reason to take that carrot off the table any time soon. Keeping things the way they are is a win-win because it keeps the Christian vote coming in while preventing the Republicans from experiencing the serious political damage that they should expect from any serious attempt to overturn Roe v. Wade. A majority of Americans support Roe v. Wade and have supported it ever since 1973 with little fluctuation. While sad, it is the reality that we face, and the Republican party is not going to risk turning off so many voters for the benefit of a voting block that they can evidently keep in their pocket with little more than lip service. So where does that leave us if we admit that Christian voters are being manipulated for political gain? Well, for starters, we need to realistically look at the limites of electoral politics. As indicated above, no political party is going to have the political capital to legislate the overturning of Roe v. Wade any time soon. When it comes to government actions, we are left with embracing policies that can reduce the number of abortions performed. It so happens that policies that fight poverty supported by the Democratic party (and other left-leaning parties such as the Green Party and independents like Ralph Nader) and opposed by the Republican party can reduce the number of abortions because many woman get abortions out of a sense that they will not be able to financially support a child. Easing the economic strain of low-wage earners, making child-care accessible to single mothers for work and for school, and ensuring that all people can receive decent health care – these moral and Biblical issues of standing up for the poor while fully worthy as issues in their own right have the virtue of reducing the conditions that tempt people into getting abortions. So if you are a Christian, consider voting next time for a candidate whose policies will better honor God’s concern for the poor and thereby better combat abortions, instead of voting for an empty promise.